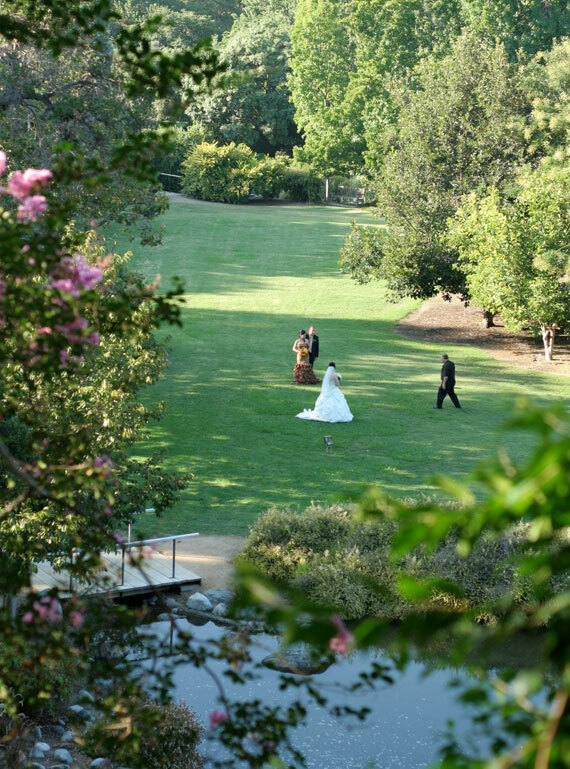 The Los Angeles County Arboretum amd Botanic Garden provides naturally beautiful, unique settings for wedding ceremonies or receptions. 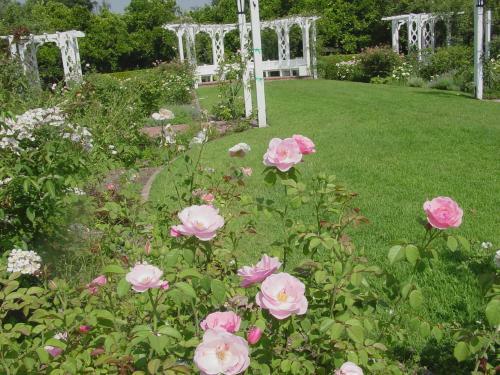 Popular locations include the Bauer Lawn (surrounding fountains), Queen Anne Cottage lawn, Rose Garden, Waterfall/Meadowbrook, and the Celebration Garden. Our intimate Rose Garden, tropical waterfall, and lush flowers and plants are picturesque settings for a perfect wedding. Our wedding season is during the daylight savings months of April through October. All ceremonies and receptions begin after 5:00 p.m.
Fees do not include rentals, staffing, security deposit, general liability insurance, and/or tram service, if applicable. Fees are subject to change without notice. Limitations: Paid fees entitle guests to specified reserved location, only. Electricity is available in various areas; however, you must provide lighting and a generator for the reception. Dressing rooms and/or kitchen facilities are not available. You may pay the admission and view the various locations at your leisure or schedule an appointment with the Wedding Coordinator for a private tour. For your convenience, all catering is provided exclusively through the Arboretum on-site caterers, the Fresh Gourmet, at the Peacock Cafe 626.446.2248. If alcohol is served, you must hire (1) security guard for every 75 guests in addition to purchasing $2,000,000.00 general liability insurance. (Purchase of general liability insurance is not necessary if the reception is held on the terrace of the Peacock Cafe). All verification and documentation are due 1-month prior to event. General liability insurance coverage in the amount of $2,000,000.00 is required for weddings and receptions. All rentals for chairs, tables, etc. must be arranged exclusively through Dolphin Event Services 626.795.5131 or Town & Country Distinctive Rental Services 626.795.7700. Removal of equipment and debris is required immediately following the event. Amplified music is allowed at moderate volume to prevent disturbances to wildlife and neighboring residents. Filming and photography fees are waived on the day of wedding if reservations are made in advance at The Los Angeles County Arboretum and Botanic Garden. Bridal couple may utilize all Arboretum sites for photography. A nonrefundable reservation fee of 20% of site fee listed above and completion of the Application and Permit for Use of Regional Parks (P&R 82-A) is required to schedule a reservation. This is a “No-Smoking” facility. Smoking is prohibited at all County facilities, per County Ordinance Code 17.04.645. Every courtesy will be extended to those who utilize the Arboretum as long as it does not impede public use. If you have any questions, please call the Wedding Coordinator at 626.821.3211.